Case holders are the heart of the salt bath annealing system. 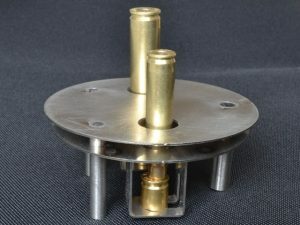 Designed to fit the Lee Precision Melter exclusively, the case holder is key to making the Precision Melter into a safe and effective tool for annealing your brass. Standard case holder. Fits the Lee Precision Melter and accommodates a wide variety of small and medium cases. Large case holder. 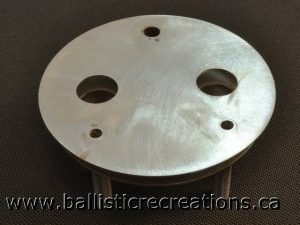 Fits the Lee Precision Melter and accommodates large diameter cases such as WSM and SAUM series, and .50 BMG. The case holder functions simultaneously to support cases in the bath, hold the temperature thermocouple, and protect the user from the heat of the bath. It would be difficult and dangerous to anneal without it. 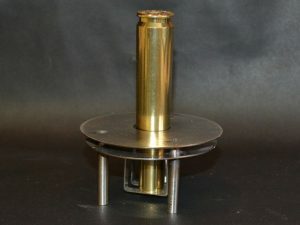 The case holder is available in standard configuration with two holes for cases from .222 Remington to .375 H&H Magnum, or with a single hole for large diameter cases such as the Winchester Short Magnums or .50 BMG. Sturdy, welded stainless steel construction. 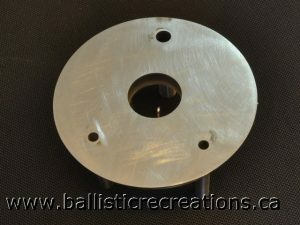 Short cases can be elevated with a spacer like this one, made from a 9mm pistol case with the primer pocket drilled out.